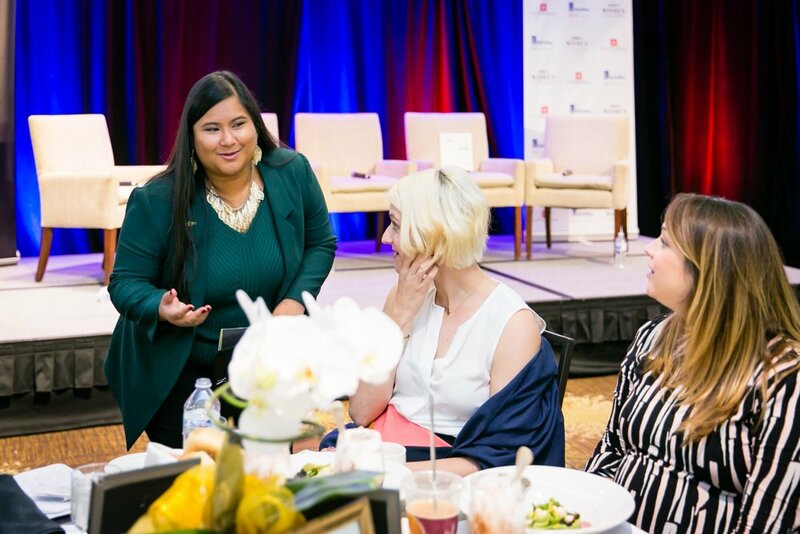 Audrey Soriano, Manager of Leadership Development at CAUSE, welcomed guests and introduced the Women in Power program as a way to create opportunities for candid discussion regarding issues that women leaders face and to explore strategies for overcoming them. She spoke on how her own life was shaped by the female role models around her and invited the audience to share some words of wisdom they’ve received from others by writing them down on “Words of Inspiration” notecards. The cards were then collected and redistributed to other guests during the program. Kim Yamasaki, Executive Director of CAUSE, then came onstage to share more about the organization and the importance of Women in Power. She shared that this year marked the 10th anniversary of the Women in Power program. While she acknowledged the tremendous strides that have been made for women’s rights, she also cautioned that the recent Brett Kavanaugh hearings and the continued wage / pay gap are signs that we still have a long ways to go in order to truly achieve gender equality. She said, “In order for us to truly find gender equity, we’ll need to shift our mindsets, alter our approach, and change our cultural understanding.” Sponsors, board members, elected officials, and promotional partners were also recognized. Afterwards, Adam Ma, Community Relations at SoCalGas and Board Vice Chair of CAUSE, spoke on SoCalGas’ ongoing support for the Women in Power program and the progress made in ensuring that women are in positions of influence and leadership. He recognized the female leaders of SoCalGas in attendance and highlighted their intention to continue efforts in ensuring gender equality in leadership roles. “Thank you for this honor – I am so humbled. Thank you CAUSE for your work and your inspiration and your passion to provide pathways and opportunities for women to learn and succeed. All are critical for a stronger community, state, and world. this conference is so important – thank you to the speakers and conference organizers – I’m so sorry I can’t be with you today. Sisters – we all have our own story. Blessed and wonderful moments. Trials and challenges that tested us. Ups and downs that got us to this place – today. This moment. Cherish every minute of it. Take the time today to be in the moment and listen to each other – put the phones down and reach out to someone in the room you don’t know. Hear the stories of our speakers and ask questions. And reflect on your journey – your path. Talk to the mirror (if you have doubts or fears) in the bathroom and walk out with confidence. The panel featured Sienna Babb, Founder & CEO of WMN / WRK; Alice Y. Hom, Commissioner on the Los Angeles City Commission on the Status of Women and Girls; and Wendy Greuel, Commissioner on the Los Angeles Homeless Services Authority. Vivian Long, Director of Programs at the Long Family Foundation (LFF), served as the moderator for the panel. The panelists were invited to share and discuss their own personal experiences in response to a series of questions and talking points surrounding their work and the challenges they’ve encountered. As part of her introduction, Sienna shared how her journey to founding WMN / WRK started with realizing the inaccessibility of finding lawyers and legal resources who understand and empathize with experiences unique to women. Through WMN / WRK, she hoped to create a resource for women to rely on when they need legal services. Lastly, Joi spoke on the intricacies of the wage gap and how it disproportionately affects women across different ethnic groups and backgrounds. While progress is being made, she spoke on the importance of inclusivity among boards and leadership positions who can influence decisions from the top. Because diversity of thought and perspective are an asset to any next generation leader looking to build community, this breakout session prioritized encouraging teams to openly communicate with each other and to establish the environments ncessary to be able to do so. During this session, Alison emphasized the importance of utilizing effective communication styles and active and reflective listening to ensure that everyone’s experiences are heard and respected. Attendees of the session were invited to practice active and reflective listening with each other and debriefed on how the activity made them feel and think. Emilie hosted a session on how to more effectively articulate our personal stories as a means of inspiring others into action. In an age where the stories we tell have the power to shape our world, we have access to endless content at the touch of our hands. By allowing ourselves to be vulnerable, Emilie stressed that conference attendees would be able to inspire greater action and change to lead our communities. Emilie actively engaged with the audience and invited them to share their own personal stories. She shared how language and playing with time can make how one tells their story more effective. The breakout session closed with an inspirational speech by President Barack Obama. Next, Linda Akutagawa, President & CEO of Leadership Education for Asian Pacifics, Inc. (LEAP) was invited to the stage. Linda remarked on the importance of the community coming together, emphasizing, “Leadership requires all of us, not just one of us.” Linda’s remarks on leadership served as a reminder that just as women should support and elevate other women, so too do community organizations need to help and elevate each other’s missions. As the luncheon portion concluded, guests dispersed to attend their second and last breakout session for the day.